Is it time to get education, locally? Is it time to introduce or expand your implant dentistry discipline into your practice? Is it time to spend time with colleagues in a relaxed informative environment? 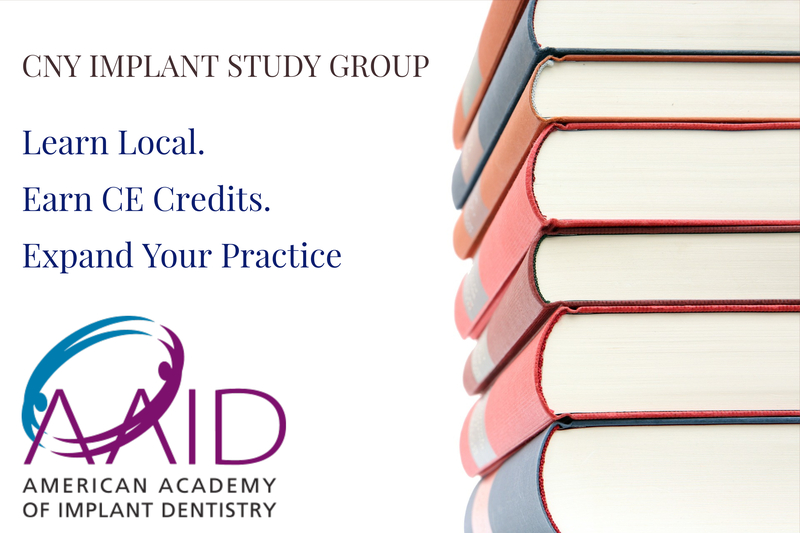 If so, please consider joining the AAID CNY Implant Study Club. I am very excited to inform you that the thirteenth year of the CNY Implant Study Group-AAID Study Club-Mentor 2 Program has been planned. Our 12th year demonstrated a significant membership that participated in case presentations, new technology and a critical view of reconstructive treatment planning. Our membership has grown to include doctors and staff from Herkimer, Utica, Rome, Oneida and Syracuse. As a result, we willmaintain a fourth session in 2019 and offer a total of 12 CE Credits. As a credentialed member of the American Academy of Implant Dentistry (AAID), I will provide a vehicle to teach and demonstrate many aspects in the growing field of implant dentistry. I would like to encourage you to renew, join or tell a colleague about the CNY Implant Study Group-AAID Study Club. Please allow me to share ideas from experienced implant lecturers and a collegial relationship while receiving continuing education credits, locally. Prestige of learning from an AAID sponsored local study group. AGD and ADA-CERP continuing education credits provided by the CNY Implant Study Group-AAID Study Club at a very affordable fee. As a member you can present cases from practice to the Study Club for presentation, discussion and suggestions for treatment options. Increase your implant cases by educating your patients to the benefit of implant dentistry.